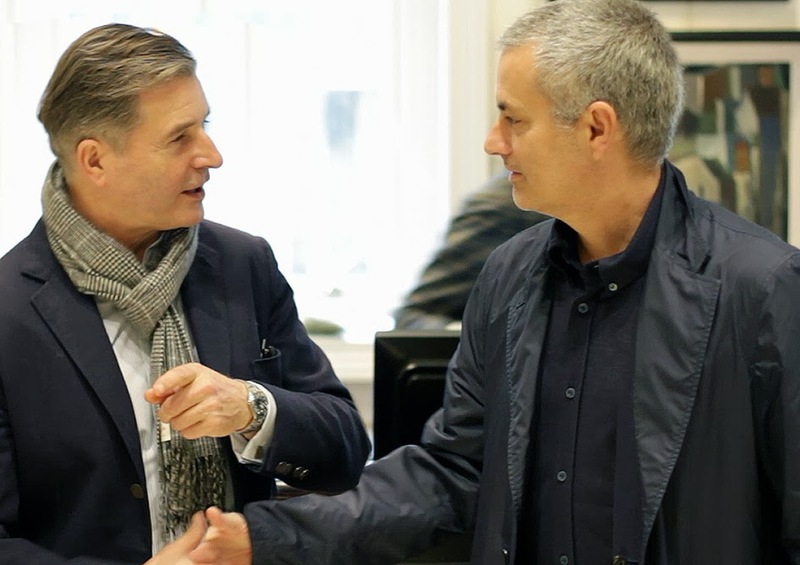 I had a call from our Sloane Street shop advising me that Jose Mourinho would be making a visit to do a little bit of Christmas shopping and would I look after him. Well of course I was more than happy to help out. Jose slipped into the shop quietly, decked out head to toe in navy blue. A man after my own heart. For those of you who read my blog you will know that navy blue is my favourite colour. I began by showing him around pointing out various items of clothing that I thought would appeal to him. "How about a parka outerwear jacket" I said, pulling one off the rack in red, perfect to wear on the touchline. He nodded and said "I'll try it in navy blue." What about a heavy knit pullover? "Does it come in navy blue." "Naturally" I replied. I was beginning to warm to this theme and proceeded to show him almost anything in navy. Just when I thought I was on a roll he raised an eyebrow and asked me if the navy knitted vest came in grey which happily it did. I knew that he had children so I showed him our kids department his eyes alighted on a picture of my Sussex Spaniel and as I know very little about football I realised that we had found common ground in dogs. He chose some presents for his son and it goes without saying they were in navy blue. I decided to leave him to browse around on his own as he is a man who knows exactly what he wants and my sales patter was having little effect. In fact it may have been detrimental. After he had settled up, he slipped quietly out of the shop wishing everyone a Happy Christmas as he left. I shall be going to the Chelsea v Liverpool match after Christmas and shall have no problem spotting Jose as he will no doubt be head to toe in navy blue. Come on you Blues! No sooner than I had cut the ribbon for our Regent St shop opening than I was on a plane heading once more to the Middle East, destination this trip, Bahrain. Yes you guessed, another shop opening, if we carry on at this rate I am going to need a double. As with most Middle East countries shopping takes place in Malls, this was to be no exception. Our new shop is located on the 1st floor of the Bahrain City Centre Mall. Anchoring the mall as seems to be the tradition was the very smart Kempinski Hotel, and being German owned everything worked seamlessly for my overnight stay. There being no meetings scheduled for the morning gave me the opportunity to see a little bit of Bahrain. The official tour guide had been arranged from the Ministry of Culture, a very well informed man named Ali Saleh who in a mere two hours proceeded to educate me about the history of Bahrain. I learnt that Bahrain had originally made its name in pearl diving not, oil as I had always presumed. I was pleased to learn that the Bahrainians are passionate about their ancient culture, leading one prominent citizen to trawl the world seeking out lost Arabian books that were mainly to be found in the West and creating a museum to house these treasures. I had said that whilst I admired all the towering sky scrapers, could he take me to see something of old Bahrain. We headed to Muharraq Island where ancient houses and streets had been restored which for me was what visitors to the Middle East are most excited by. We stopped by the souk that was bustling with market traders selling hand woven rugs, clothes shops that had changed little from the 1970s with advertising that was so dated it would be fashionable in Hoxton. I paused to look in the window of a shop selling vintage watches and noticed on the dial of one of the watches a name which at first I thought I had misread so I put my glasses on and took a closer look and it indeed read Durex, it was a schoolboy moment as I imagined if asked what make was my watch I could exclaim, " I'm wearing a Durex". We continued the tour visiting a magnificent Fort built by the Portuguese in 1529 and now sensitively renovated. By now it was a balmy 30 degrees as we headed back to the hotel to prepare for the afternoon's interviews. 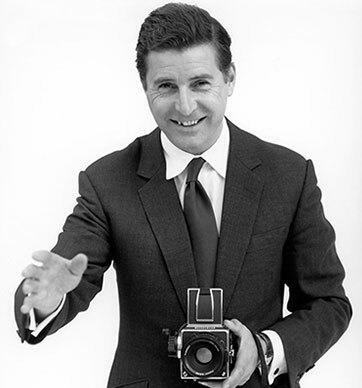 Naturally I wore the Khaki lightweight suit that I mentioned in my last blog and which I was frequently photographed in, meaning I would need a quick change for the party in the evening otherwise they might think, poor fellow he's only got one suit. I wore a one button unlined blue cotton chambray suit and coincidentally one that had Mother of Pearl buttons; it was formal without being stuffy. It was a glittering party being firstly introduced to the British Ambassador Iain Lindsay who in turn introduced me to Sheik Alkhalifa of the Bahrain Royal Family who remarked that his family shopped in our London stores. There is something about the people of Bahrain that I found different on my previous trips to the Middle East not only are they extremely friendly but a sense of relaxation pervades the atmosphere one that I could become accustomed to very easily. I am looking forward to their opening another shop in the region to give me the perfect excuse to take them up on their kindness and hospitality.